Dover’s “new” hoverport was opened in 1978, having been built in the Western Docks, adjacent to the Prince of Wales pier and facing the original train ferry dock over the entrance to the inner docks. Seaspeed was a joint hovercraft service operated by British Rail in association with SNCF. 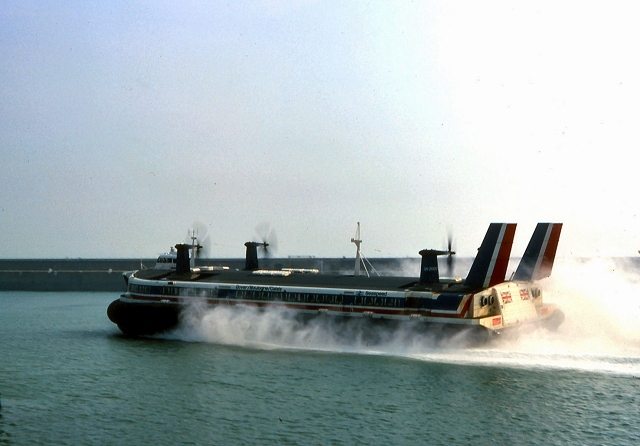 They began cross-Channel services from Dover to Calais and Boulogne using SR-N4 hovercraft in August 1968. The two hovercraft were named The Princess Margaret and The Princess Anne. By the time this photograph was taken in 1979, both craft had been considerably lengthened increasing the passenger capacity of the craft from 254 passengers to 418. The cross-Channel service hovercraft closed in 2000 following the opening of the Channel Tunnel (in 1994) and due to the age of the SR-N4 hovercraft. Following the closure of the service, both craft are now preserved at the Hovercraft Museum at Lee-on-the-Solent.